Kenwood has posted a couple of promo videos showing how their 2014 line of head units handle smartphone integration. Using screen mirroring and app modes, users will be able to enjoy smartphone functionality, for both iOS and Android, on their car receivers. Kenwood offers their new eXcelon head units, which have built-in navigation (DNX891HD & DNX691HD), one with networked navigation (DNN991HD) and three multimedia receivers (DDX8901HD, DDX5901HD & DDX491HD). These are all double-DIN receivers. The connected entertainment system receiver DNN770HD for example, has built-in wi-fi which can connect to a vehicles wi-fi network (if available) for online features like YouTube, social network integration, email capabilities etc. There are other multimedia and navigation receivers available too without wi-fi connectivity. Kenwood receivers use MHL connections to enable users to hook up compatible Android devices and enjoy smartphone features using mirroring and app control. iPhone connectivity uses USB ports. HDMI input is also available on most head units. Just last month, the Japanese parent company JVC Kenwood Corporation announced that JVC Americas Corporation and Kenwood USA Corporation would merge to form a singe subsidiary in the United States, JVC Kenwood USA Corporation. This is part of a global strategy first announced in 2012. 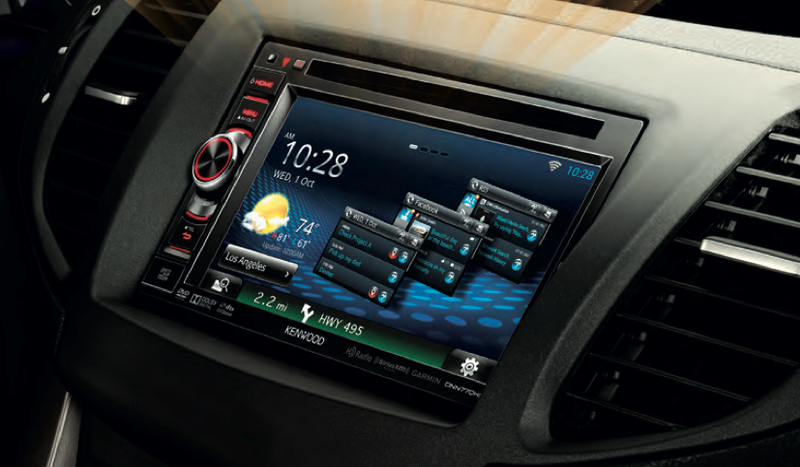 Get full details about Kenwood's 2014 smartphone integrated head units from their website.